Our newsletter reaches 1400 households and will be distributed by US Mail on February, June, and October. Newsletter ads will be reflected in the space below. Ad Rates for Medlock Matters: For each issue, full page ads range from $307 - $445 depending on placement. 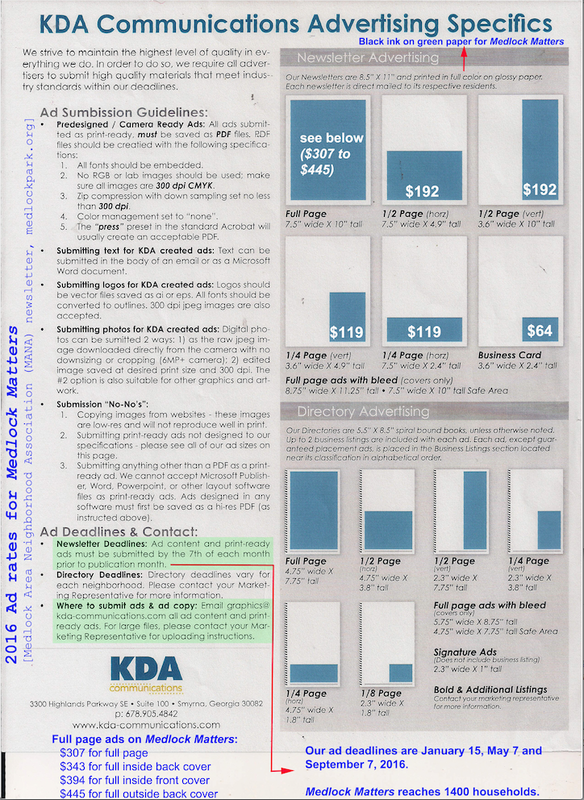 Half-page ads are $192, quarter-page ads are $119 and business card-size ads are $64. Ad Specifications for Medlock Matters (.jpg): This file outlines ad specs such as file formats and resolution. KDA will create ads for an additional $25 fee. Southern specialties that are professionally prepared by our chefs right to your home or office. Mention this add and receive $25 off your first order of $200 or more. Servicing the Atlanta community for over a decade! Upscale thrift stores benefiting homeless pets. Over $500,000 donated to animal charities! Friendly service. Prescription drugs. All insurance/drug cards accepted. Friendly service. Attend our Breast Cancer Awareness events in October. Join our doctors and fellow survivors to learn more about breast cancer care. It's not just our business - it's our neighborhood! Keeping it in the neighborhood. We live here, we love it. We sell it! We rent it! Call us today! Special for Medlock Park Area Residents: Haunt Package! See newsletter for coupon and details.